Along with other representers of the AI community, Dr. Damian Borth is giving an interview about how Artificial Intelligence is driven by Deep Learning. With this, it will also affect how people will think about their own mobility, once autonomous vehicles are established. Joining the plenary about “Big Data Processing and Analysis”, along with Bonnie Saynay (Invesco), Rupini Deepa Rajagopalan (University of Reading), Michael Schmidt (Deka Investment), Dr. Damian Borth spoke about the potential of Artificial Intelligence in the finance industry and responsible investment. A schedule of the event can be found here. Deep Learning is currently disrupting industry by industry, whether it is the automotive, insurance industry, banks and retail, and holds enormous potential for each one. 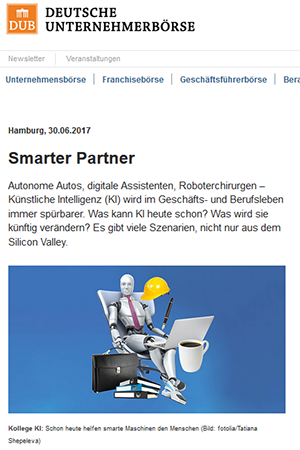 Furthermore, Artificial Intelligence has a place in production (industry 4.0), marketing (social media) or other fields of analysis as said in the interview with Handelsblatt by Dr. Damian Borth. More can be watched in the video, which can be found here. 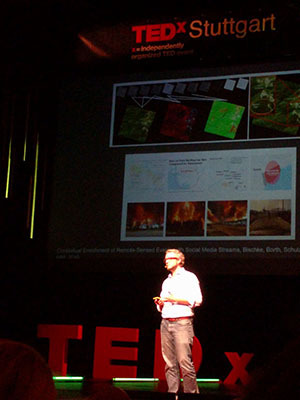 Introducing DeepEye as a platform to raise situation awareness for emergency response teams during natural disasters such as wildfire, Dr. Damian Borth gives an interview for ScienceNode. By combining social media and satellite imagery, the ambition of Deep Eye is protect lives and our planet The article and video interview can be found here. 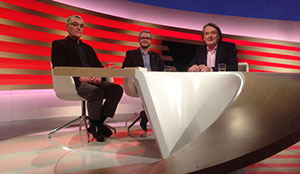 Together with Gerd Gigerenzer and Gerhard Schurz, Dr. Damian Borth was invited to the German live TV show scobel to talk about “Vorsicht Prognose”’. With the help of Big Data, machine learning algorithms are able to generate and process huge amounts of data to forecast the future. Is this a good or bad idea? The TV show can be watched here. 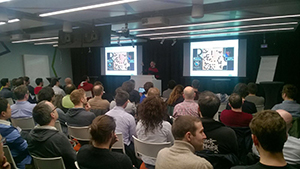 As one of only 30 invited deep learning researchers in Europe, Dr. Damian Borth had the honer to participate at the Google Deep Learning Workshop 2017 in Zurich. Along with other speakers from all over the word, the Workshop aims for an exchange of ideas in the area of Deep Learning, as well as the presentation of Google current research in said scientific area. Dr. Borth presented the work around Visual Sentiment Analysis. The Frankfurter Allgemeine Zeitung (FAZ) covered Dr. Damian Borth as “Germany’s Mr. Deep Learning” in its portrait in its issue on July 3rd. Besides an outline of Artificial Intelligence impact as a key technology in near future for multiple industry, Dr. Borth points also to the quickly growing demand and lack of experts in Germany in this area. The portrait in German can be found here. Providing an insight to the current affairs of Artificial Intelligence and its meaning for the society, Dr. Damian Borth gives an interview to the DUB (Deutsche Unternehmensbörse). First held in 1986, ISC High Performance is the world’s most established and Europe’s most largest conference for the HPC community. For the first time, the ISC dedicated an entire day to Deep Learning. In co-organization with Dr. Janis Keuper, Dr. Damian Borth co-chaired the event. Besides the keynote speaker Thomas Breuel from NVIDIA, other speakers from Intel, AMD, IBM, BMW contributed to the great success of the event. Talking about the opportunities and potential of Artificial Intelligence in different contexts, Dr. Damian Borth is one of the speakers at the Management Circle Conference with the main topic Artificial Intelligence - Application Domains and Use Cases. 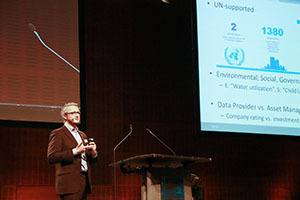 The conference took place in Munich on the 19th and 20th of June. Significant developments in the use of AI can currently be observed in the health sector, insurances and finance institutions. For this, Dr. Damian Borth and many more gather at the Swiss AI Day in Bern to give talks about the future of AI in different industries. Dr. Borth in particular, gave the opening keynote about Deep Learning as one element of AI’s future. Dr. Damian Borth gives the outlook for Deep Learning as a game changer for the business world as the Internet once was. 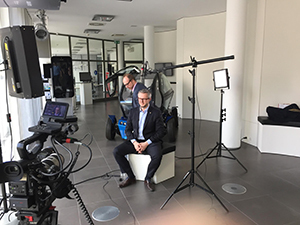 In an interview for the Karriereführer Dr. Borth explains how important Deep Learning is for several industries as well as how it might optimize sales. 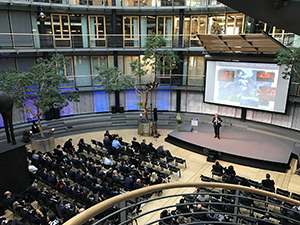 Giving a keynote at Rise Of AI Conference in Berlin, Dr. Damian Borth talks about the future of AI in society and industries. Together with many other contributors, this year’s conference takes place in the Deutsches Technikmuseum in Berlin. A video of the Borth’s keynote can be found here [X]. 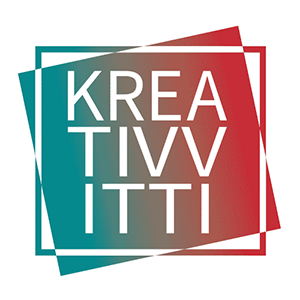 At the Trade Fair for Innovation, Creative and Cultural Industries (Kreativviti Conference) in Pirmasens, Dr. Damian Borth has been present to talk about the topic “ AI - Artificial artist or creative machine?”. A full program in german can be found here [X]. 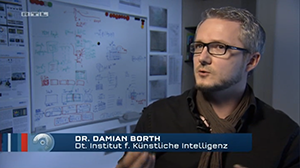 The german TV program Terra X (ZDF) is interviewing Dr. Damian Borth as part of its upcoming documentary. The documentary aims to reveals the history and present effects of technology and science on society, also giving an outlook on Artificial Intelligence and its impact to our world. 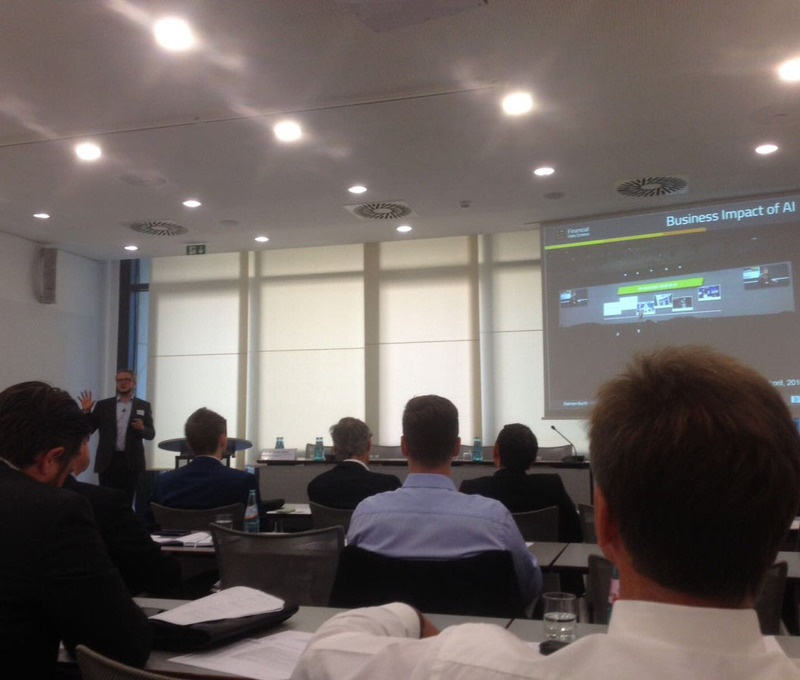 The annual Empolis Executive Forum held in Berlin has invited Dr. Damian Borth to give the event’s opening keynote. With the theme of the event: “Turning Data Into Decisions - How Machine Learning turns Big Data into Big Business”, Dr. Damian Borth’s talk "Machine Intelligence through Deep Learning - Learning to understand Data" has contributed to the discussion about how industry can use the latest achievements of Machine Learning for their business. A column by Holger Schmidt is found here [x]. Dr. Damian Borth was invited by Amazon Web Services (AWS) to Luxembourg to give a keynote about Artificial Intelligence, Machine Learning, and Deep Learning. The keynote was given in the context of a workshop at Amazon where several AWS cloud computing tools have been extended by machine learning approaches. 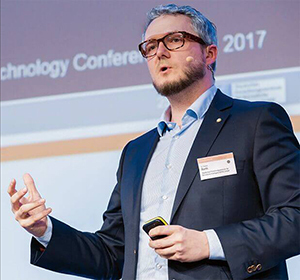 Dr. Damian Borth also has been invited to giving a talk at the CeBit 2017 as part of the “FutureTalk: the innovative conference forum” series. 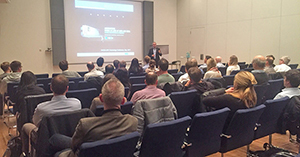 The well-attended talks presented the DFKI Deep Learning Competence Center and the latest developments in the area of deep learning. In particular, the work on Generative Adversarial Networks (GAN) was of interest. With the topic “Deep Learning: What it is and Why now?”, Dr. Damian Borth has been inviting the audience after the talk to an open discussion about the topic. The DFKI has been represented in various ways at this year's CeBit in Hannover. 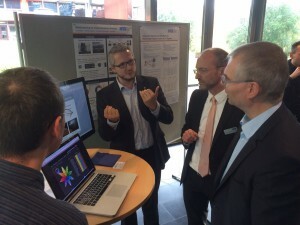 The Deep Learning Competence Center was presenting work in the areas of text, image, video and social media analysis at the DFKI exhibition booth. Deep Learning as subarea of ​​Artificial Intelligence is currently responsible for remarkable breakthroughs. The DLCC has presented its exhibits DeepEye - Deep Learning for disaster protection and crisis management - and Capttitude, a deep learning process for the generation of image texts with emotions. The annual “Allianz Forum” has set the 2017 topic to new markets, risks in investment strategies, and the future of investment. In this context, Dr. Damian Borth has hold a keynote presentation about Deep Learning with the topic: “The New Artificial Intelligence: What It Can Do And What Not”. During this event Jürgen Stark (EZB) was speaking, as well as Ruchir Sharma (Morgan Stanley). The Allianz Global Investor (AGI) asset manager has invited Dr. Damian Borth for a keynote on the future of artificial intelligence to his annual EMEA Meeting in Berlin at the Pariser Platz. In addition to Dr. Borth's keynote “Our Future with Artificial Intelligence”, the day's event was also opened by Prof. Michael Hüthner, Director of the Cologne Institute for Economic Research. The main theme of the event was digitalization in the financial world and the potential of artificial intelligence as a driving force for the economy. Dr. Damian Borth gives a talk about his research on Visual Sentiment Analysis with Deep Convolutional Neural Networks (CNN). On social networks sites like Twitter, Facebook & Co. communication is turning more and more towards visual content such as with images and videos. Being able to extract sentiment from visual content is a challenging task as presented during Dr. Borth’s talk at the Deep Learning Meetup in Munich. He introduced the Visual Sentiment Ontology (VSO) which consists of thousands of Adjective Noun Pair (ANP) concepts. Further, he talked about SentiBank and an associated deep convolutional neural network (CNN), which they use to find up to 2089 ANPs in images. This framework is able to analyse the sentiments of visual contents much better then by texts. If you want to know more about this research, please have a look at the DFKI-Newsfeed. The Meetup website you can find here. Digitization, innovation and agility are the keywords of this year's Handelsblatt annual meeting for Strategic IT Management 2017. These keywords do not only describe the ever-increasing amount of data that companies have to deal with, but also the innovation pressure on companies such as Artificial Intelligence, Machine Learning and Data Science. 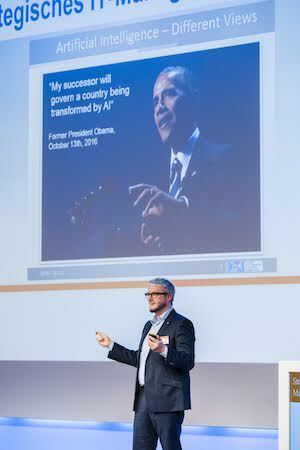 As the director of the Deep Learning Competence Center at the DFKI, Dr. Damian Borth has been invited to speak about "Deep Learning: The Revolution in Artificial Intelligence" in front of 250 CIO from all over Europe. In the words of Mrs. Ilse Aigner, Dr. Borth was able to introduce the DFKI as innovation provider in Germany and establish the broad topic of Deep Learning as a disruptive force in various industries. DFKI was thus the only research institute from Germany to be present alongside the CIO / CDOs of VW, Volvo, Ford, Porsche, Continental, AXA, Bosch and others. Together with many more speakers from several special fields the conference is being held until 25th January. A program brochure in english is available [X], as well as an interview with Dr. Borth on YouTube. 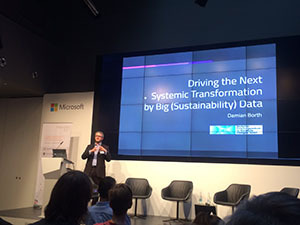 Dr. Damian Borth participated at this year’s World Economic Forum in Davos. Invited by the ZEIT Dr. Borth discussed the current affairs in the field of Artificial Intelligence in Switzerland which is recognized as an more importantly growing topic of global interest in the scope of politics, economic growth, and societal impact. Dr. Damian Borth has been named into the “Steering Group: AI and society” of the Volkswagen Foundation as one of five experts. In addition to professors from Freiburg, Munich, Pforzheim and Konstanz, Dr. Borth represents the DFKI in this topic. “The current developments, which is expected in the context of the digitization of society, have the potential to transform society in a substantial way,” states the foundation. The aim of the Steering Group is to define a funding program devoted to this theme for 2018. The Volkswagen Foundation is an independent non-profit foundation based in Hannover. 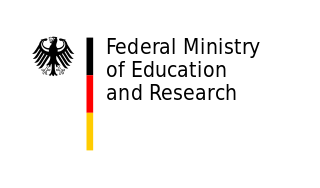 With a funding volume of around 150 million euros per year it is the largest private German science-promoting foundation. In more than 50 years of its existence the Volkswagen Foundation has supported more than 30,000 projects with a total of more than 4.2 billion euros. 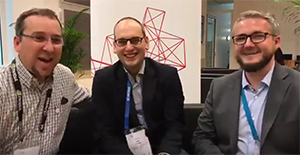 Dr. Damian Borth has the great honor to moderate an expert panel discussion about machine learning including Dr. Ralph Herbrich (Managing Director at Amazon Development Center, Germany), Michael Adendor (Senior Technical Staff Member, Architect – Predictive Maintenance and Quality, Watson IoT, IBM, Canada) and Sami Abu-El-Haija (Sami Abu-El-Haija, Machine Learning and Computer Vision, Google Research, USA) as participants. The panel discussion at VDI CESIS 2016 conference focused on recent advances in machine learning and its role in the cloud. 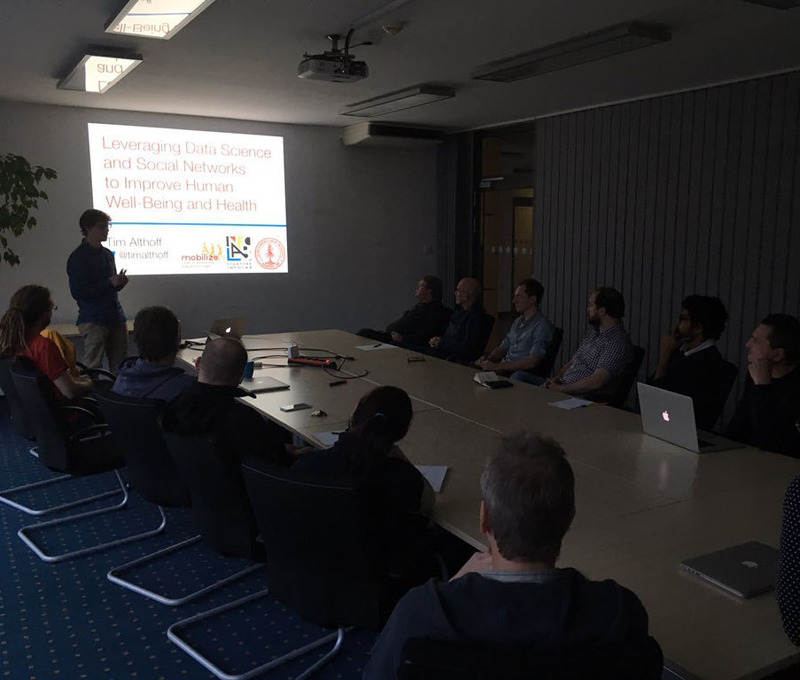 Tim Althoff - PhD candidate from Stanford - is visiting the DFKI in Kaiserslautern to give a talk about his research topic Leveraging Data Science and Social Networks To Improve Human Well-Being and Health, in which he presents a new method based in network analysis, data mining, causal inference and computational linguistic to harness the power of massive data to improve human health. For this he addresses how to leverage large-scale datasets from several sources to study if and how mobile health applications and online social communities can improve health and well-being overall. 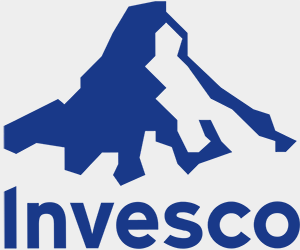 At this year's quand day Dr. Damian Borth was invited to give a talk about the potential of Artificial Intelligence, Machine Learning, and Deep Learning extending the domain of Financial Data Science at Invesco in Frankfurt am Main. 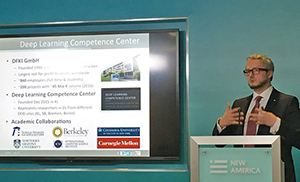 With the White House releasing a follow-up report of the October report about AI transforming our society, Dr. Damian Borth has been invited by the German Embassy in Washington DC to give a keynote about state-of-the-art of Artificial Intelligence and Deep Learning at the German-US AI Policy workshop.The discussions during the workshop at New America follows the White House ‘Artificial Intelligence, Automation, and the Economy’ report’s line of argumentation to embrace Artificial Intelligence as influencing our daily life and disrupting our industries. Dr. Damian Borth’s discussion focus was on the need for smart regulation in the artificial intelligence space. Dr. Damian Borth has been invited to Daimler’s Digital Life Tech Talk Event in Stuttgart. 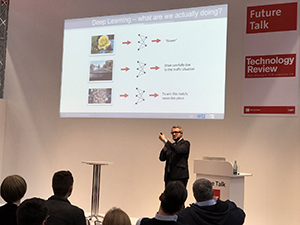 Speaking about Artificial Intelligence as driving force of digitalization Dr. Damian Borth has presented recent developments and projects of the DFKI Deep Learning Competence Center. Impressions can be found here [X]. The Baden-Würtemberg Foundation has selected Dr. Damian Borth as one memeber of the “Neurorobotik” program review committee. Neurobotik (‘Newrobotic’) is an interdisciplinary topic which gathers the aspects of neuroscience, robotics and computer science. The Baden-Württemberg foundation has granted an overall budget of EUR 4 Mio for the program. 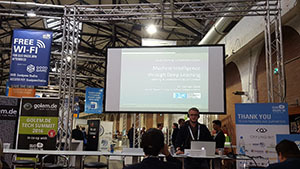 Dr. Damian Borth was invited by the faculty of architecture to speak about deep learning and artificial intelligence at the “Architecture meets Technology Symposium” at KIT in Karlsruhe. 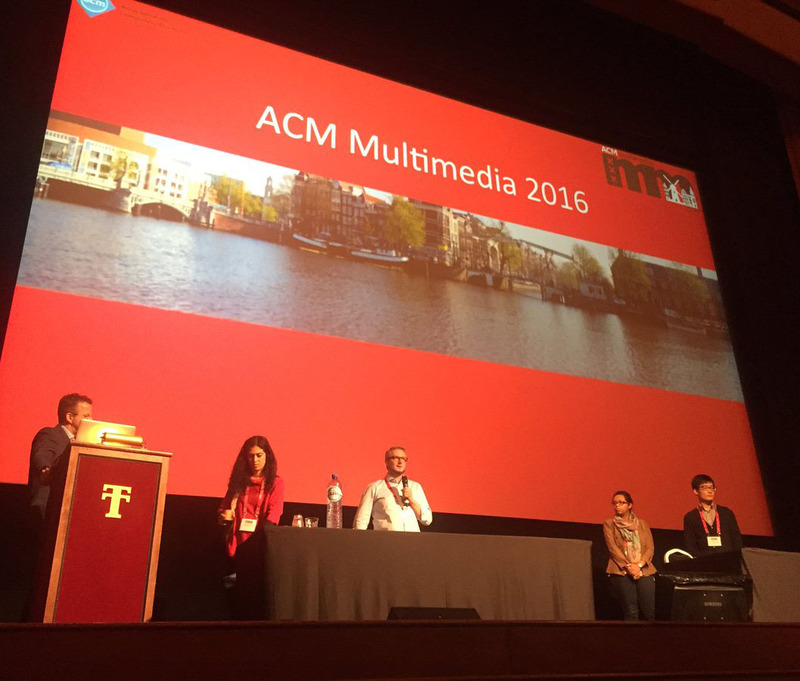 Dr. Damian Borth was invited as one of four participants to the Deep Learning Panel discussion at ACM Int. Conference on Multimedia. The panel discussed the recent momentum of deep learning in context of media technology research. 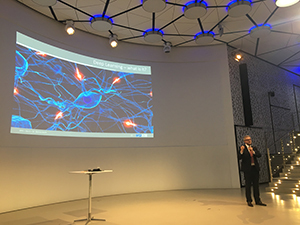 Providing an insight look at current research activities at the Deep Learn Learning Competence Center at the DFKI, Dr. Damian Borth has been talking at the MENSA annual MIND Academie event which took place this year in Mannheim. At this years NVIDIA GPU Technology Conference (GTC) in Amsterdam, NVIDIA CEO and co-founder Jen-Hsun Huang announced during his opening keynote the DFKI to join its NVIDIA AI Lab program. Only two labs in Europe have been awarded this honor and the DFKI Deep Learning Center is one of them. Along with this, DFKI will be provided with founding and the NVIDIA DGX-1 supercomputer, as one of the first research institutes in Europe. 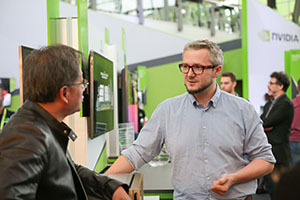 Dr. Damian Borth says: “this will complements the ambitions of the Deep Learning Competence Center to enhance basic research and industrial knowledge transfer in the field of AI.” (read more) In this context Dr. Damian Borth gives a short interview at the NVIDIA GTC Europe about the potential of using the DGX-1. Presenting PricewaterhouseCooper’s and the DFKI’s approach to detect financial fraud as anomalies in journal entries Dr. Damian Borth and Marco Schreyer speak about the future of audits and forensics in large scale financial and accounting data by the use of Deep Learning and Stacked Autoencoders. The agenda of this event can be found here [X]. Discussing the topic of why big data and artificial intelligence being ready to disrupt investment security markets, Dr. Damian Borth provides insights about this topics at the third Financial Data Association Conference. In particular the issue of artificial intelligence vs. human intelligence, big data processing and analytics for the finance industry were discussed in his talk and panel discussion about Financial Data Science. With this year’s theme ‘(e)Motion’ Dr. Damian Borth was honored to give a TED talk at the TEDxStuttgart about “Our future with Artificial Intelligence” and the question what if machines would become aware of themselves and how this would transform the current understanding of us as humans. To read more about the event and to watch Dr. Damian Borth’s talk click here [X]. 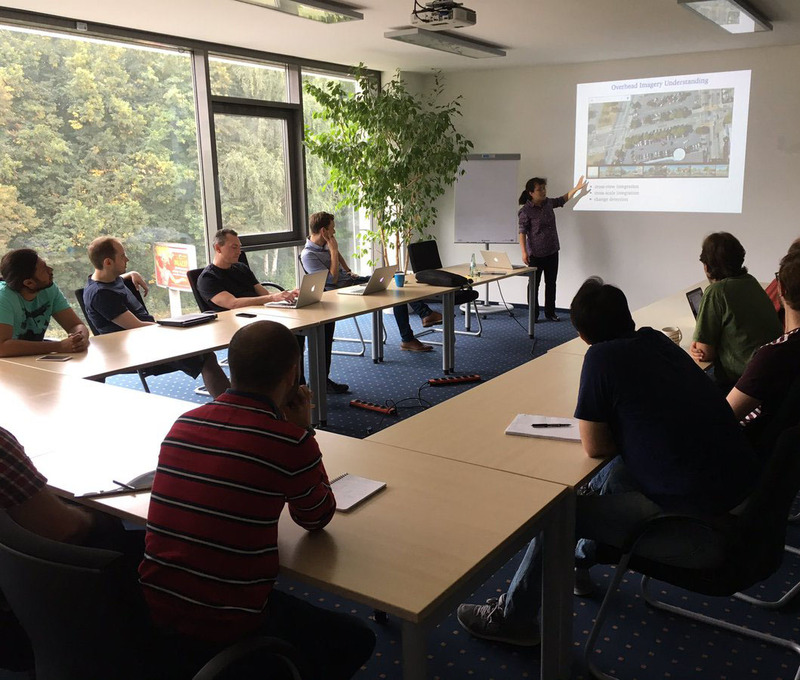 Prof. Stelly Yu from UC Berkeley visits DFKI Deep Learning Competence Center (DLCC) to give a talk about deep learning and satellite image analysis and discuss potential collaborations with DFKI DLCC and UC Berkeley. 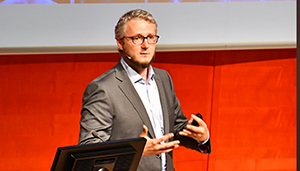 The IIB summit in Stockholm invited Dr. Damian Borth to give a keynote about the topic: “The Global Pulse: Addressing Sustainable Development Goals with Artificial Intelligence”. In particular the usage of satellite image data was discussed as disrupting force in this area. In parallel, the investment journal “Responsible Investor” covers Dr. Damian Borths research in a features article focusing on the usage of AI for Good. Dr. Damian Borth gives an invited talk on "Deep Learning for Visual Classification of Adjective Noun Pairs in Context of Image Captioning and Video Analysis" at the ISC High Performance Conference in Frankfurt. In addition to Dr. Borth's talk, three other talks, including one by Andrew Ng, were devoted to the topic of Deep Learning. A summary of the event can be found on Youtube. 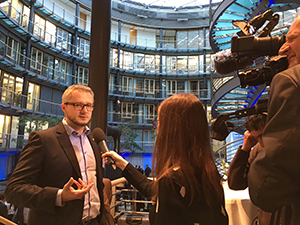 Dr. Damian Borth gave an Interview to the WDR 5 radio program to talk about the definition of Artificial Intelligence and current state-of-the-art in the Deep Learning following the potential usage of AI in everyday life. Here a snippet of the interview [x]. 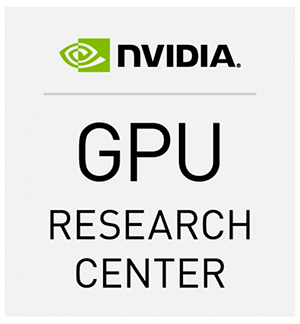 Since its continuous work in the area of GPU research in the field of text, image, video and social media analysis, DFKI Deep Learning Competence Center has been chosen to join NVIDIA’s GPU Research Center. With the status as a GPU research center, the researchers from DFKI have access to latest devices and software for GPU computing to further explore the wide field of GPU utilization for deep learning. 22.06.2016 Dr. Damian Borth Gives A Talk At ISC, Frankfurt a.M.
Dr. Damian Borth talks about Deep Learning for Visual Classification of Adjective Nound Pairs at ISC. Furthermore, he introduces the SentiBank and the Yahoo Flickr Creative Common 100 million (YFCC100m) dataset, for which more information can be found here [x]. 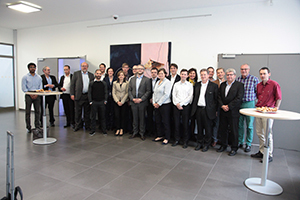 Dr Damian Borth - head of the DFKI Deep Learning Competence Center - and Werner Ballhaus - head of the Innovation Advisory Board of PwC - have welcomed the internal and external visitors while a visit from PwC and NVIDIA at the DFKI at Kaiserslautern. This cross research-area event was opened by Prof. Didier Stricker. He presented the DFKI as a Research institute to our guests and gave many examples of several areas of AI. After the lunch break, Dr. Damian Borth gave a presentation about “Deep Learning for Computer Vision”. Likewise Prof. Joseph van Genabith and his team have presented “Deep Learning for Language and Text”. As external visitors, Ralph Hinsche and Axel Koehler from NVIDIA had the opportunity to present the topic “GPU Accelerated Learning”. Finally, Bernd Reimer and Marco Schreyer have presented the current research from PwC in the scope of Data Analysis, Visualization and “Fraud and Anomaly Detection”. This event was completed with a tour through the SmartFactory-KL and a live demonstration of the Augmented Reality-Guide from the Spin-Off IOXP. Along with many other events, Dr. Damian Borth was one out of six provocateurs to discuss the topic of Cybermanufacturing Ecosystem and Infrastructure at the Cybermanufactoring Workshop on Enabling Composable & Modular Manufacturing through Abstractions in Berkeley. At this year’s Situation Awareness Workshop at ICSI in Berkeley, California, USA, Dr. Damian Borth was invited to present recent work around deep learning and satellite image data analysis for situation awareness and natural disaster monitoring. The workshop was set up as an interdisciplinary event connecting domain experts with machine learning experts from UC berkeley, University of Stanford, Lawrence Berkeley Laboratory, and DFKI. ‘We consider data the fabric of modern life’ says Dr. Damian Borth in his invited talk about Visual Sentiment Analysis with Deep CNNs at Twitter in Berlin. Working closely with Twitter at the Multimedia Opinion Mining project, this gave both Dr. Borth and Twitter a unique opportunity for exchange of ideas and discussion of potential collaboration activities. Dr. Damian Borth gave an Interview to welt.de about how computers are able to learn from unstructured data and to deal with searching for pattern in order to find meaning. 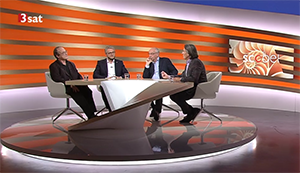 The 3sat-TV-Show “Scobel” dedicated a live show on the 28.04.2016 to the topic “Die Roboter-Rivalen”. The reason for this show was triggered by the media hype about the victory of Google’s computer program “AlphaGO” against one of the world’s best Go-players, the south korean Lee Sedol. “AlphaGO” is basically using two categories of neuronal networks and a tree search. So, it is based on a Deep Learning procedure. In this context, Dr. Damian Borth and Thomas Metzinger were invited to discuss the need of ‘ethik of machines’ in terms of recent successes in artificial intelligence. In particular, whether it is possible for machines to pass the Turing test, in order to analyze and evaluate data sets independently and autonomously. Covering the topics “Art and Artificial Intelligence?” Dr. Damian Borth had the opportunity to present recent advanced in deep learning to students from KIT and HfG Karlsruhe. He presented insights about machines starting to create art at the HfG Karlsruhe. Along with other talks from experts from several institutions Dr. Damian Borth presents the concept of Deep Learning for Visual Classification of Adjective Noun Pairs and its Application at the Quo Vadis 2016. Further he introduces the SentiBank and the Yahoo Flickr Creative Common 100 million (YFCC100m) dataset, for which you can see more information here [x]. In current time Artificial Intelligence is even more present in daily life. Considering the recent success of Google’s Alpha Go in the game Go, Dr. Damian Borth gives a slight overview of how AI is working, in particular Deep Learning. Together with the MOM, the SentiBank and many more project, the DFKI was present at this years CeBIT in Hannover. A short impression can be found here [x]. The current news of a go match between a human player and an artificial intelligence in which the AI has won, is one of the topic Dr. Damian covers in the Interview with RTL. He explains the principles of artificial intelligence and how the machine was able to defeat the human player by using latest advanced in deep learning. Speaking about Industry 4.0 and Social Innovation, Dr. Damian is invited to present his opinion about the interplay between Artificial Intelligence and the rapidly changing working environment at Hitachi in Brussles. With the recent advances in Deep Learning researchers demand more and more data for supervised training. Through collaboration between several researchers, The YFCC100M, one of the largests publicly available datasets for deep learning is made available over the last weeks. The YFCC100m consists of 100 million images and videos from Flickr including its metadata, all made available as creative common licence. This dataset and its description were published in the current issue of the Communication of ACM (“YFCC100M: The New Data in Multimedia Research” by Bart Thomee, David Shamma, Gerald Friedland, Benjamin Elizalde, Karl Ni, Dough Poland, Damian Borth) as title story and cover sheet. Dr. Damian Borth as part of the group of researchers welcome this novel dataset and hope for exciting discoveries in the research community. More information about the YFCC100M and its browser can be found at www.yfcc100m.org. Dr. Damian Borth has the great honor to moderate an expert panel discussion about machine learning including Dr. Ralph Herbrich (Managing Director at Amazon Development Center, Germany), Michael Adendor (Senior Technical Staff Member, Architect – Predictive Maintenance and Quality, Watson IoT, IBM, Canada) and Sami Abu-El-Haija (Sami Abu-El-Haija, Machine Learning and Computer Vision, Google Research, USA) as participants. 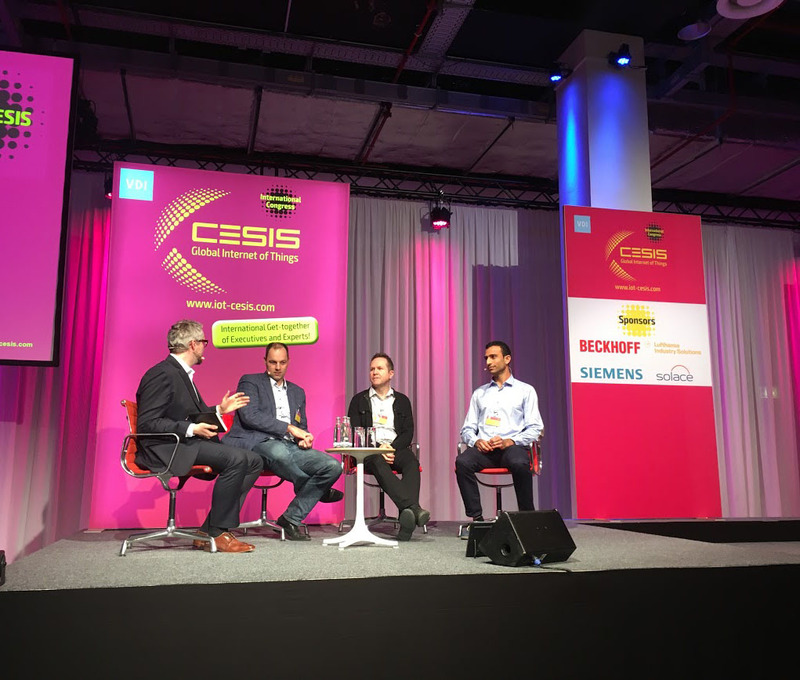 The panel discussion at VDI CESIS 2016 conference focused on recent advances in machine learning and its role in the cloud. Dr. Damian Borth gives a talk at the Joint Spring Conference 2016 of E-Finance Lab and IBM to discuss the topic of “Identifiers and Identification Management in the Financial World and Beyond - Requests, Solutions, and Applications” with other participants from science and practise. A video of Borth’s speech about “Identifier Matching in Responsible Investment – a Machine Learning Approach” is to be found here [x]. 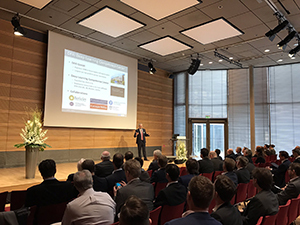 The WIV Family Office invited Dr. Damian Borth to give a keynote about “Artificial Intelligence” at their annual meeting in Frankfurt am Main. Dr. Damian was speaking in front of as selected group of guest including beyond others Prof. Rombach from Fraunhofer IESE, and member of the board of the University of Kaiserslautern. 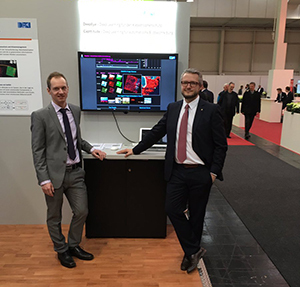 Dr. Damian Borth and Dr. Christian Schulze both introduce the concepts of Adjective Nound Pairs (ANP) and Visual Sentiment Ontology (VSO) together with SentiBank, which has been already shown to have a broad spectrum of application domains. To do experiments on several datasets, applying multiple low-level features are needed, like real world CSA provided by several European law enforcement partners. 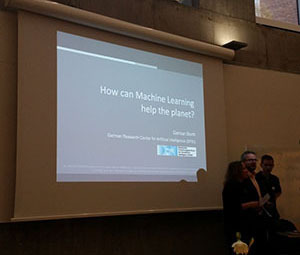 ‘How can Machine Learning help the Planet?’ this was the question Dr. Damian Borth discussed in his talk at the Quantified Planet Data Summit. The QP itself is a non-profit and global community that collects real time sensor data. The goal is to build an open platform for innovation in health and environment data for a better world and to achieve the Sustainable Development Goals. Being invited to give a keynote on Driving the Next Systemic Transformation by Big (Sustainability) Data at the Reporting 3.0, Dr. Damian Borth showed in a vivid kind of way how to handle this issue with for example current technology in satellite techniques, or how machines can imitate the art style of several artists to change a given picture into this style. The presentation to this keynote can be found here [x]. Having the goal to improve the synergies between data science and financial markets more than 30 international participants joined the first Financial Data Science Association Conference (http://fdsa.io/). Beside several plenary sessions and panel discussions, Dr. Damian Borth spoke introduced the principles for Financial Data Science and discussed usage of Artificial Intelligence for Good. The DFKI announced that Google became a shareholder of the DFKI. 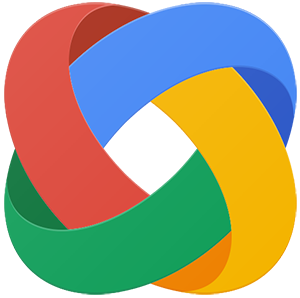 The MADM group presented their Eye Tracking technology and Visual Sentiment Analysis (SentiBank) with Deep Convolutional Neural Networks (CNN), which was names as one of the key technologies by Google. In this context, MADM was also covered in an TechCrunch article. In the context of the BMBF sponsored project "Multimedia Opinion Mining", Dr. Damian Borth, gave a guest lecture at the ICMA Center of the Henley Business School about how tools developed at MADM can be used for social good. The lecture presented novel way of mining social multimedia to gain insights about critical issues around environmental, social, and governance issues. Dr. Damian Borth served as a member of the assessment committee at the Investment Innovation Benchmark (IIB) summit in London. Damian was appointed to the committee due to his background in machine learning and large-scale data processing and will serve as an expert to evaluate FinTech submissions. The assessment committee consists of member from academia and some of the largest pension fund worldwide. Our paper describing the 100 million images and videos Flickr dataset: "YFCC100M: The New Data in Multimedia Research" got accepted at "Communication of the ACM". The paper describes the up-to-date largest dataset in the computer vision and multimedia research community. This work was a collaboration between Yahoo Inc., ICSI Berkeley, and the Lawrence Livermore National Laboratory. A pre-print is available on Arxiv.org. 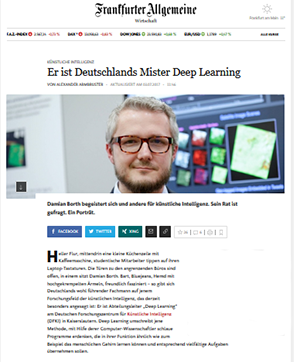 Dr. Damian Borth gave an Interview to Hannoversche Allgemeine Zeitung about the success of deep learning in computer vision research, recent progress to recognize sentiment and emotions in visual content, and how artificial intelligence (AI) can be used for social good. With the advent of FinTech, disciplines like machine learning, natural language processing, and large-scale data mining are moving into the finance and investment industry. 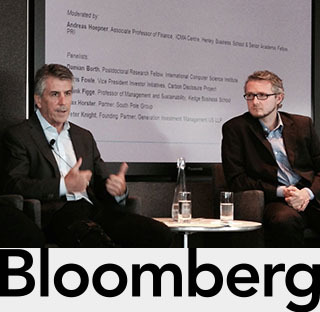 To discuss the potential of FinTech, Dr. Damian Borth was invited to moderate a Technology Panel at FinTech Bloomberg event. The panel was including CEOs and CTOs of leading startups in the area such as: eRevalue, TruValue and Bloomberg Labs. 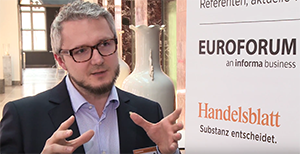 Dr. Damian Borth speaks about Big Data and Environmental, Social and Governance research and introduces together with Prof. Andreas Hoepner the concept of "Financial Data Science" at the RI Europe - a major conference in the responsible investment community. Financial Data Science embraces the processing of large datasets with machine learning methods and welcomes approaches such as opinion mining from public available data on the web. The CfP to the Multimedia COMMONS workshop (MMCommons) is out! We invite the community to attend MMCommons and explore the possibilities for novel research, future data challenges, and new benchmarks offered by this large-scale open dataset (YFCC100m dataset). The MMCommons will be held at the ACM Multimedia 2015, Brisbane, Australia around October 26-30. 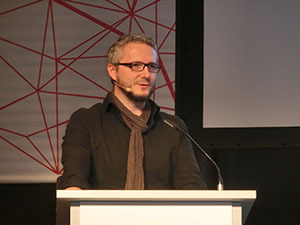 By April 2015, Damian Borth became the new head of MADM. Before this position Damian was a postdoctoral research fellow at the International Computer Science Institute (ICSI) with Dr. Gerald Friedland and at UC Berkeley with Prof. Trevor Darrell where he was involved in various project sponsored by DARPA, IARPA, and the Lawrence Livermore National Laboratory. His research focuses concept detection from social multimedia including trending topic detection, visual sentiment analysis, and multimedia opinion mining. The project Multimedia Opinion Mining (MOM) was presented in the context of Data Science during an UN PRI event at the London School of Economics. 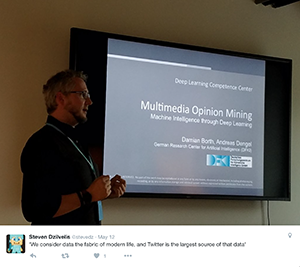 Dr. Damian Borth introduced data science and opinion mining and outlined how it can be used for social good. The event was later interrupted by an evacuation due to the Holborn Fire in London. 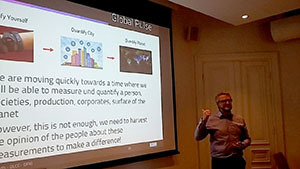 Dr. Damian Borth speaks about "Mining Insights from Public Data" at an event of the University of Reading and outlines concepts and goals of the Multimedia Opinion Mining (MOM) project to the audience. During a visit of the Bundesministerium für Forschung und Entwicklung (BMBF) in the Bay Area, the BMBF invited DAAD scholarship researcher from ICSI to join an exclusive dinner with Deputy Secretary Dr. Georg Schütte. Dr. Damian Borth introduces the BMBF funded project Multimedia Opinion Mining (MOM) to the delegation during the dinner. Multimedia Opinion Mining (MOM), a 2.5 years long project funded by the BMBF, aims to address the challenge of opinion mining in social multimedia content. The main goals of MOM are: (1) analyze social media data to detect and track trending topics. (2) understand multimedia content with respect to its sentiment and opinion. (3) discover individual persons or groups able to influence propagation of topics in social networks. And finally, (4) forecasting the progression of identified topics into the near future. 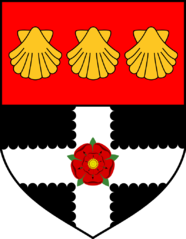 The project will be coordinated within MADM and lead by Dr. Damian Borth.